In early August, Maui Grown Therapies became the first medical cannabis dispensary to begin sales to qualifying patients on Maui when it received the green light from DOH. 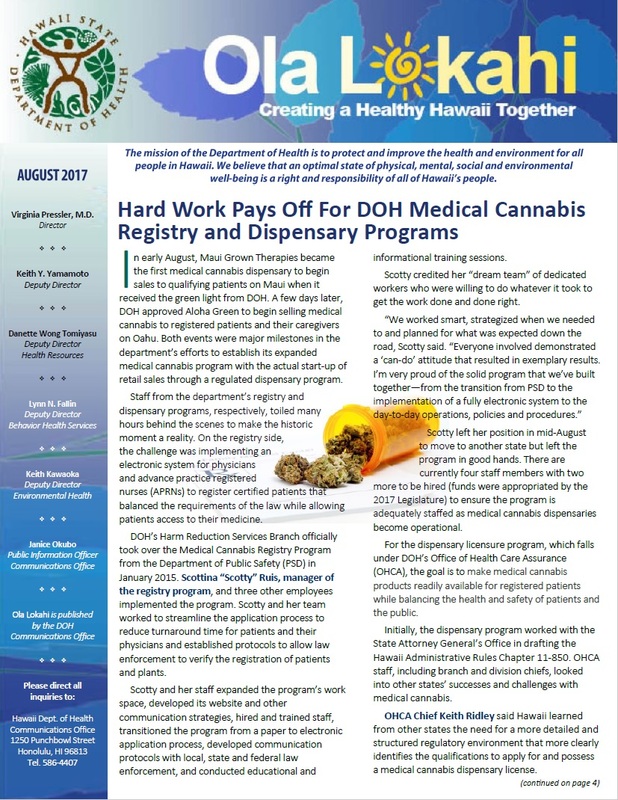 A few days later, DOH approved Aloha Green to begin selling medical cannabis to registered patients and their caregivers on Oahu. Open the attached newsletter pdf to read more. Gov. David Ige, together with DOH and the HDOA, recently announced the state’s plans to prevent the spread of rat lungworm disease. Open the attached newsletter pdf to read more. The DOH Public Health Nursing Branch (PHNB) recently teamed up with the Hawaii Literacy Program to teach children at Mayor Wright Homes how to properly wash their hands to avoid getting or spreading germs. Open the attached newsletter pdf to read more. The Department of Health’s Developmental Disabilities Division (DDD) has announced the launch of Community Learning Services (CLS)–a new initiative that enables Medicaid beneficiaries to actively explore and engage in chosen community activities and social roles, rather than remain in segregated settings or isolation at home. Open the attached newsletter pdf to read more. Ocean safety and the role of lifeguards in Hawaii over the past century were at forefront of the 2017 Drowning Prevention & Ocean Safety Conference sponsored by the Hawaii Department of Health, City & County of Honolulu and the Hawaii Tourism Authority. Open the attached newsletter pdf to read more.